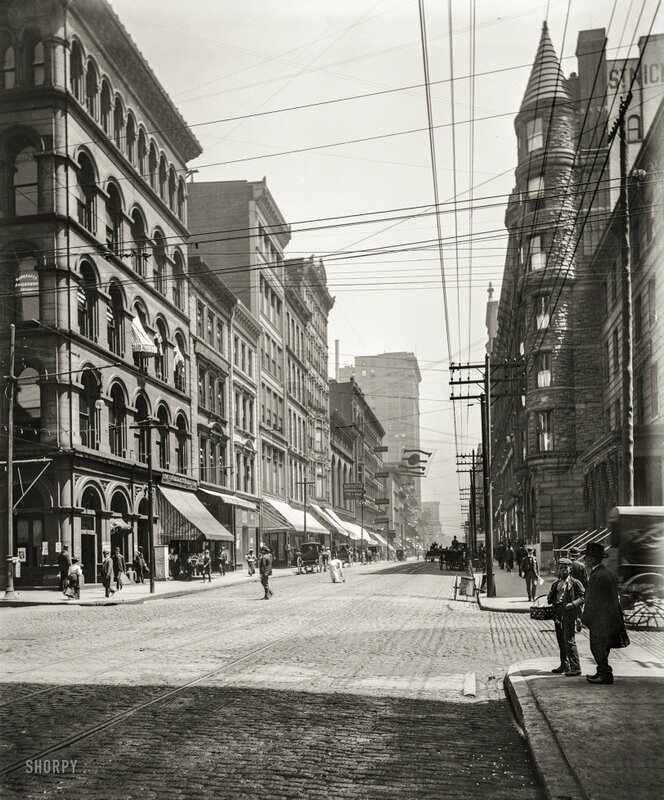 Cincinnati circa 1900. "Fourth Street looking east from Race." Compare and contrast with this view from a decade later. 8x10 glass negative. View full size. Submitted by trackes on Fri, 11/11/2016 - 7:07am. should really get longer handles on his tools. I can imagine how his back feels when he gets home after a full day. Anyone know what that flag is in the middle distance? Can't make it out even on the full size image. Submitted by Vonderbees on Thu, 11/10/2016 - 8:23am. Looks like they buried all those overhead utility lines on the right by 1910. Where Did All The Wires Go? Submitted by Baxado on Thu, 11/10/2016 - 6:28am. A decade can make a difference in tech I guess.